Easily made with hand tools and lots of fun to forage and collect! 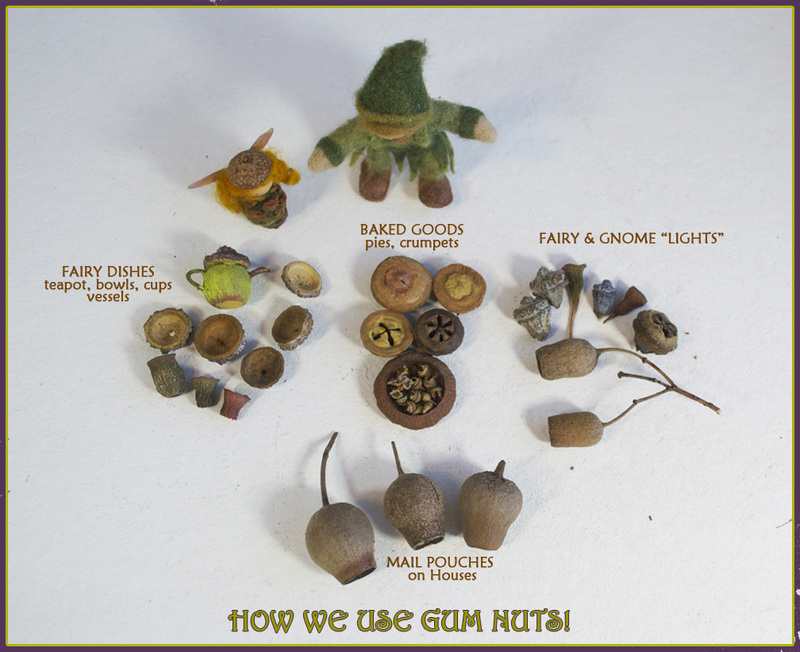 These are typical seed pods that I use, including different types of eucalyptus pods and acorn and acorn caps. There is a magical quality about seed pod dishes, something that quickly takes our imagination to the worlds of nature and Wee Folk effortlessly. 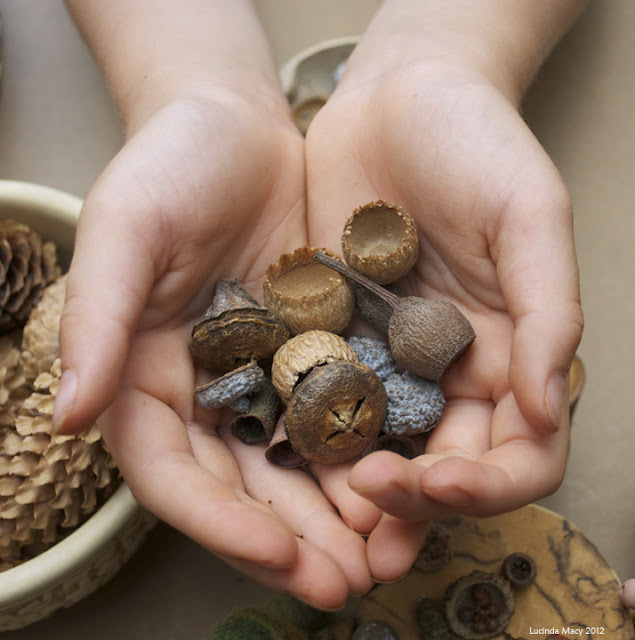 We all love picking up and collecting seed pods and Nature's gifts & this provides a wonderful use for them. 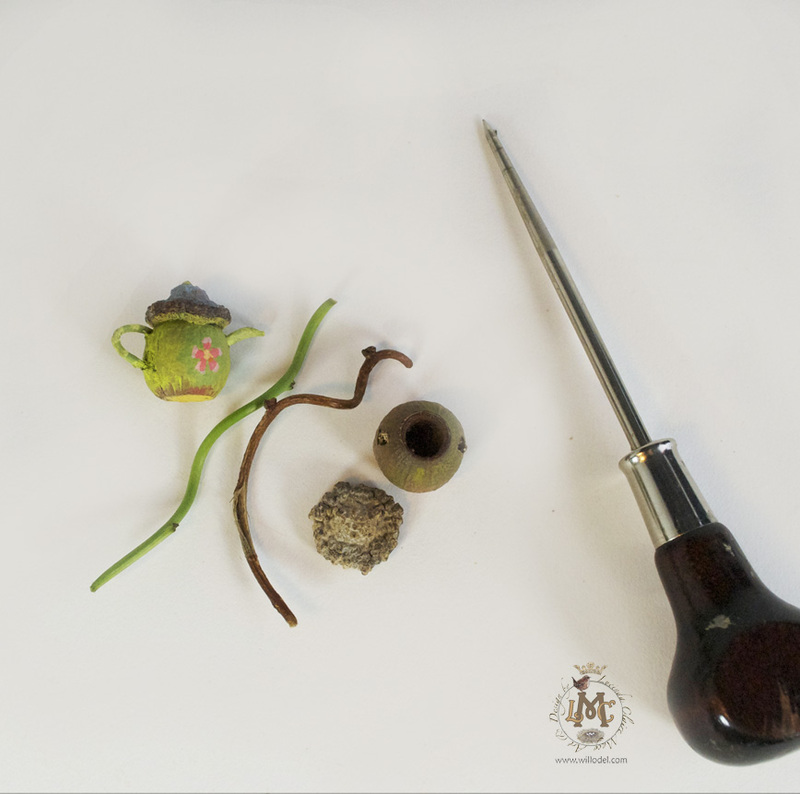 The kinds of seed pods or seed pod caps you can find and use, will vary depending on your locality. What I have access to are different kinds of acorns and their caps, different kinds of eucalyptus pods or "gum nuts" and rose hips of vaious sizes. I also use small vines from Virginia Creeper plant or grapes for handles. You can learn what seed pods and caps are available by nature walks and observation. The Autumn season is when they are most abundant to collect. I like to get new ones each season for their nice color and good condition. 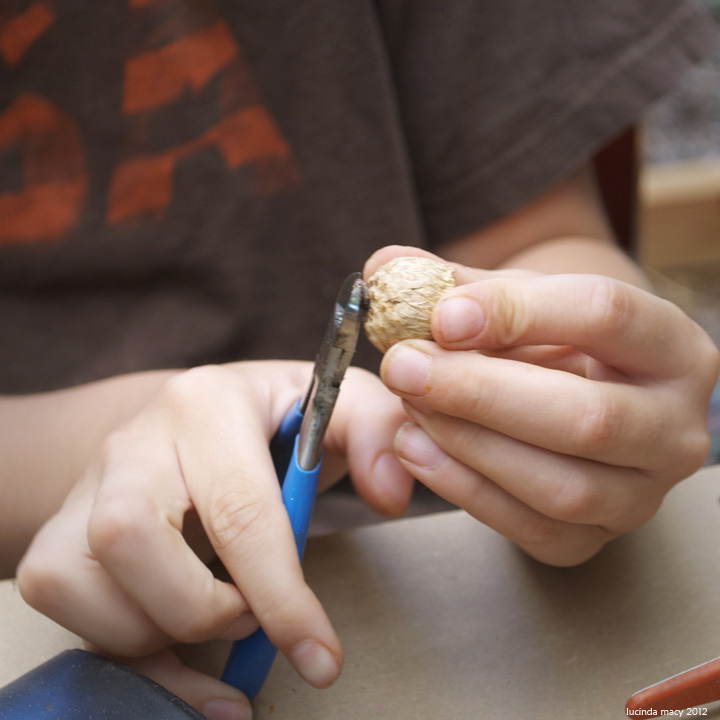 Hand tools are all that are needed for making seed pod dishes. 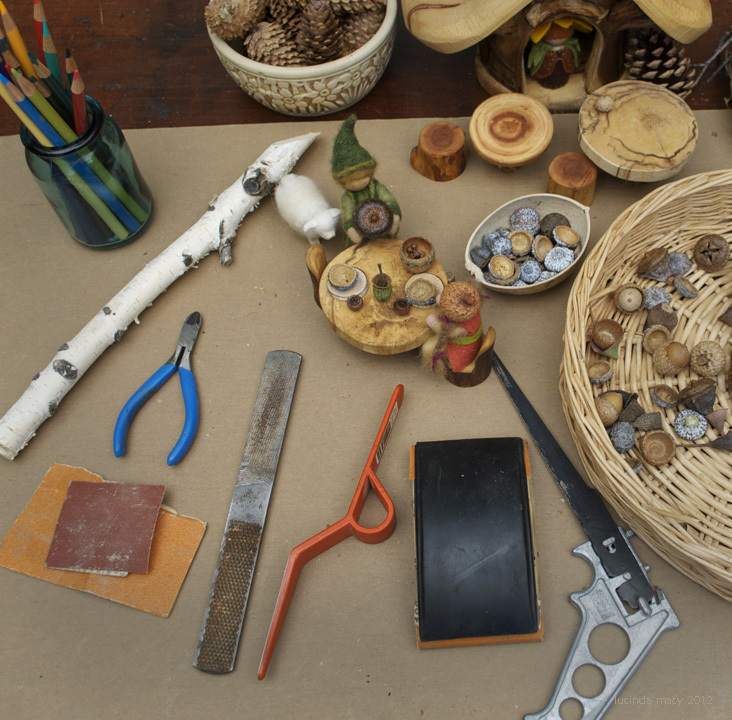 There are variations of all these tools which will also work. 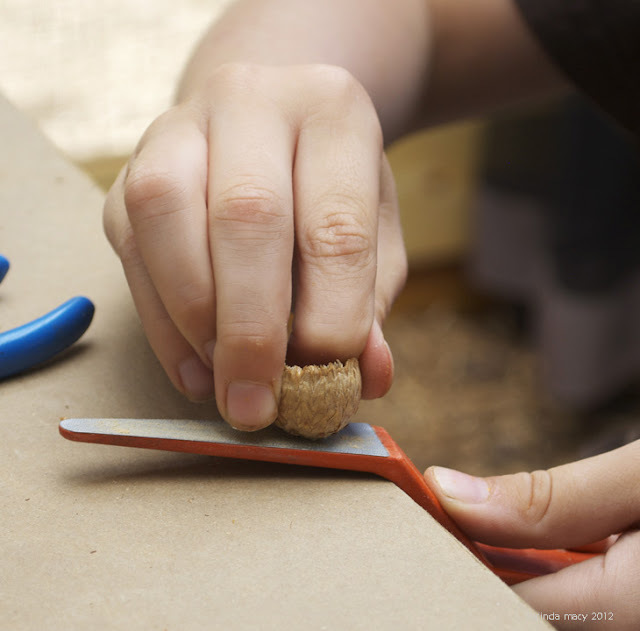 The primary work is that of sanding ..which can be done with sandpaper, sanding block or fine wood rasps. The other useful item is a hand held little saw with fine teeth, such as pictured or some variation of it. Wire cutting pliers are handy for stems, also known as "diagonals". For some things, such as a Teapot lid, a good glue is needed also. Colored pencils or paints can be used to decorate dishes as desired. If you do not have access to the tools above, you can still do these projects with sand paper or pumice stone, you can cut stems with utility scissors or pruning shears or knife. The sandpaper should "fine" or about 120 grit. I always put a piece of brown paper or cardboard down for my work surface, such as the back of a large tablet or side of a cardboard box. This way if there is glue, paint or knife cutting involved, it protects your table. 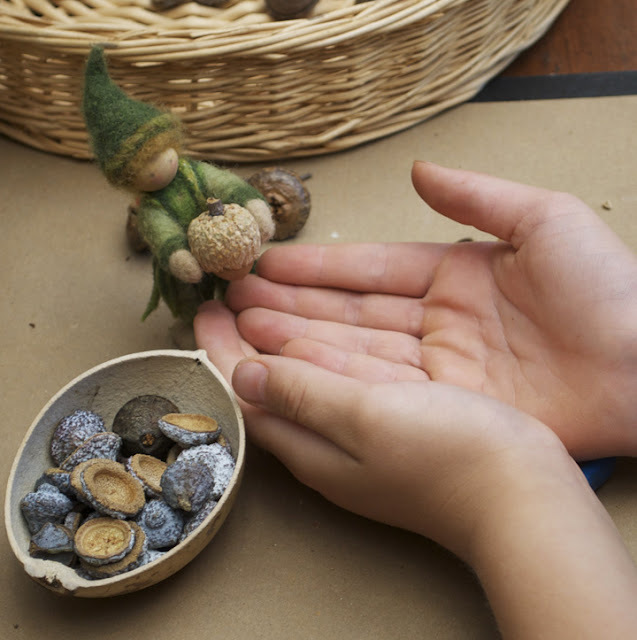 Leif, my helper, brings a nice acorn cap to make into a big bowl.Seedpods or their caps are usually used upside down , so stems must be clipped or sanded off and the surface made nice and flat so it will stand level and not tip over. I use small pliers made for nipping wire, to cut off the stems, which are sometimes quite hard. Utility scissors or garden nippers will also work. After stems are cut off, the smoothing and flattening needs to be done. Getting a nice even and flat surface is favorable. 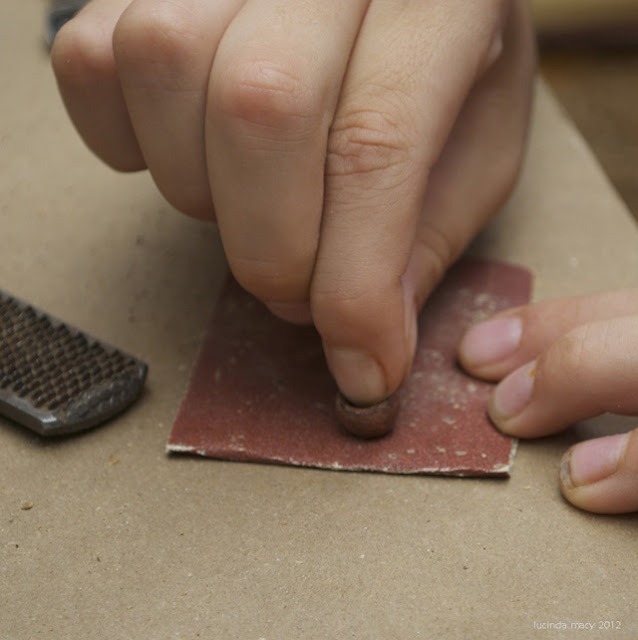 It is easiest to achieve this by using a hard and flat tool, such as a sanding block or flat metal file or sander. Here a small flat file is used , made for sanding small items. 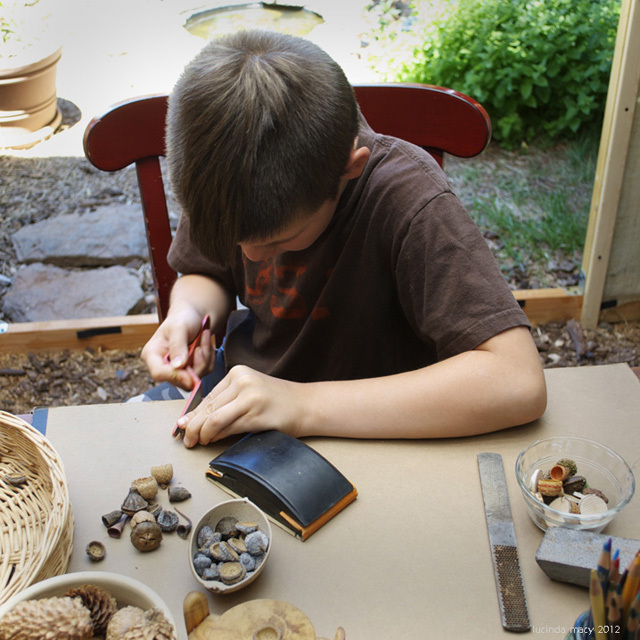 The metal, flat surface makes it easier to keep the surface level, more so than folded paper sandpaper. Sanding the top edge is done here with folded sandpaper, this is just to even up the sometimes ragged edge. The top edge does not have to perfectly even or flat, just look like you like it to. A quick way to decorate is with colored pencils, I use Prisma Color pencils. It can also be left quite natural if one desires to keep it that way. The dishes can also have beeswax /oil put them to preserve them. This will usually darken them. 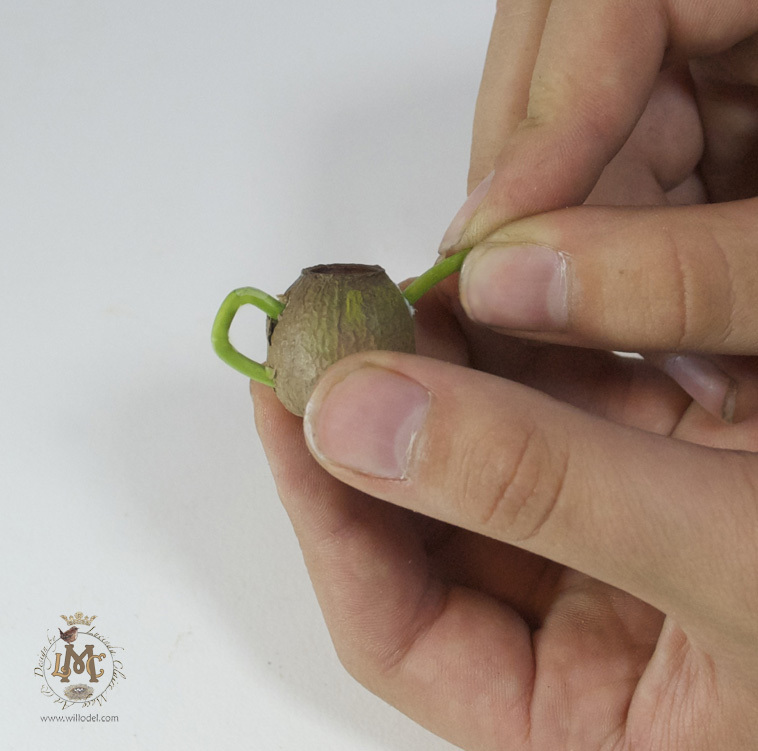 Making cups is the same process as making bowls, just using smaller seed pods or caps . This shows a type of eucalyptus pod that make a good little round cup. I also use a bell shaped eucalyptus pod that makes a taller, flared cup. 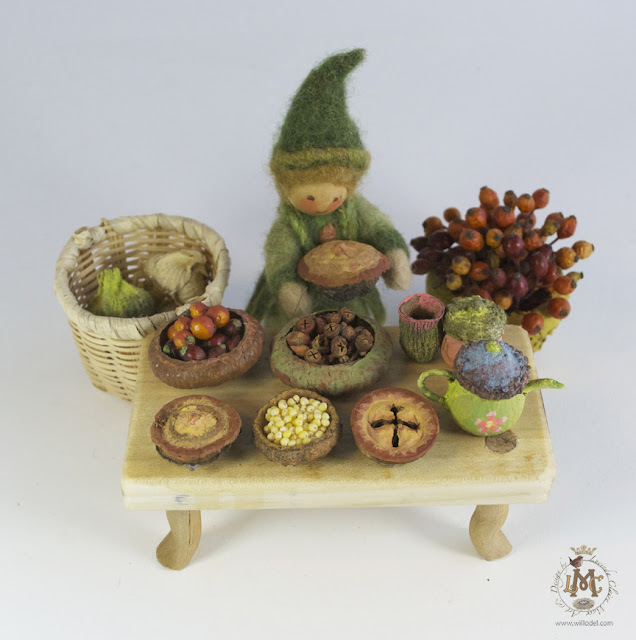 Leif is showing us his good food table, all the bowls and containers are acorn caps, pies and teapot are different kinds of eucalyptus pods, food is tiny rose hips, tiny eucalyptus seeds and millet. In the bask are Hollyhock seeds painted green to be cabbage. making plates & platters is simply cutting very thin slices of limbs. 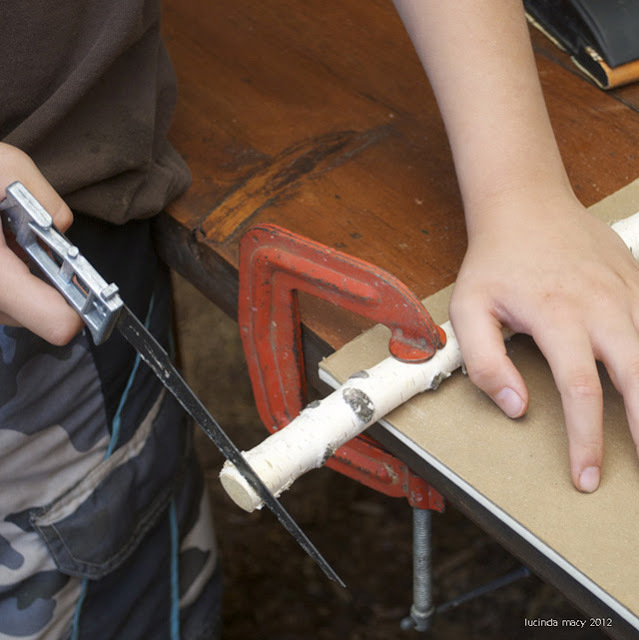 This is a small paper birch limb, it is soft wood and easy to cut with the little fine toothed utility saw. With practice you can learn to saw straight down so the the plate is even. It helps a lot to use some kind of clamp so the limb will not roll. 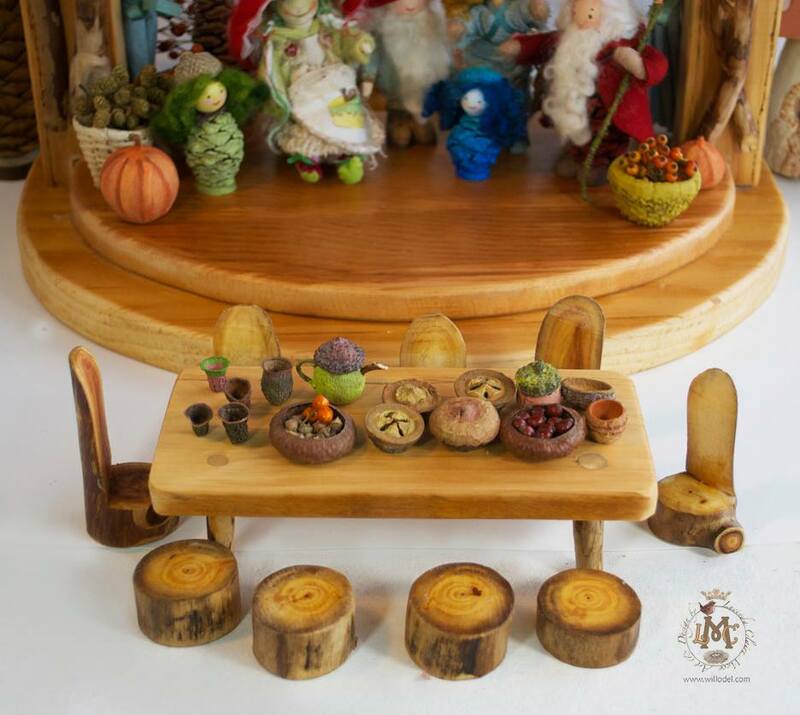 I also use aspen limbs and other softwood. The plates can be gently sanded and decorated if desired. 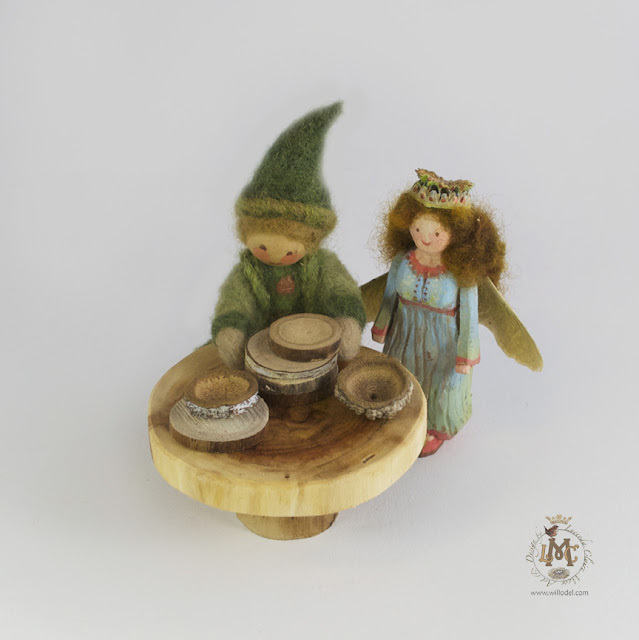 Leif and the Blue Fairy are stacking plates & bowls for the Acorn Cafe! 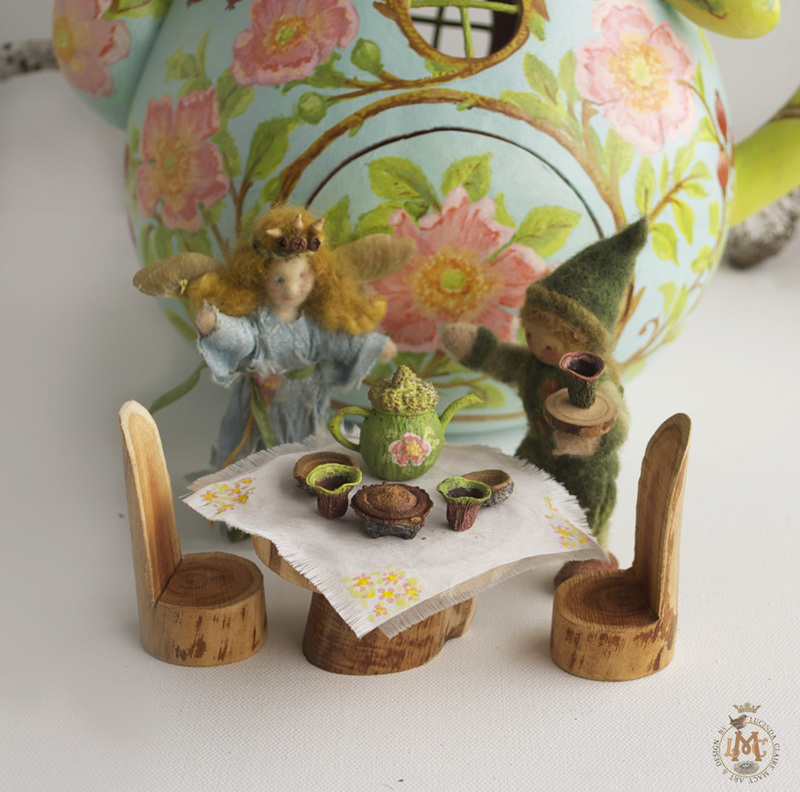 Fairy Teapots are often asked about. 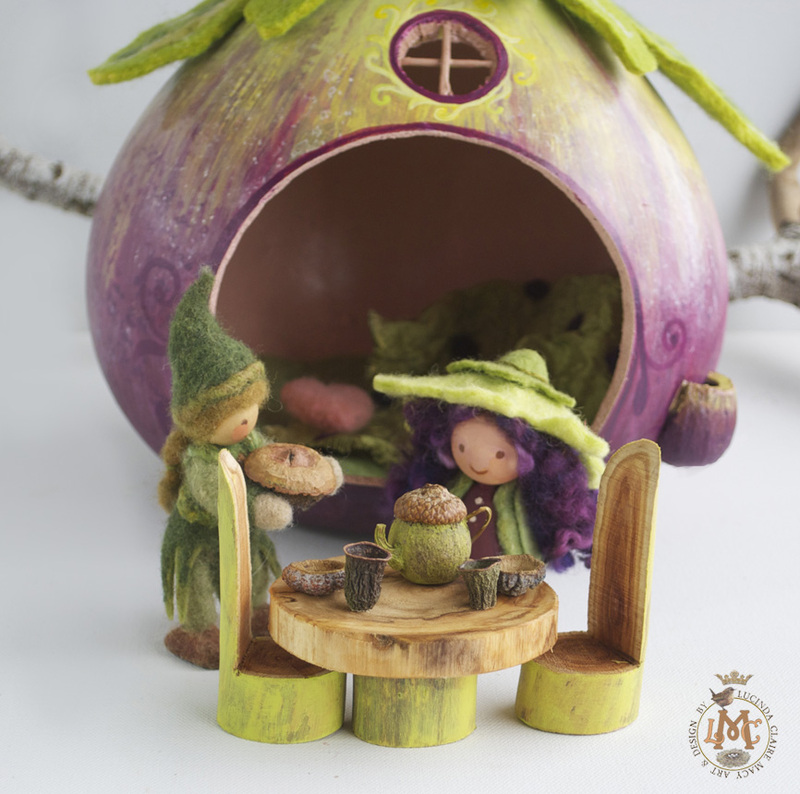 They capture the imagination & send it on a lovely journey to the woodland meadows with sweet grass and mint tea. Making the teapot is a bit more of a challenge, require patience and perhaps more than one try. The Teapot is made from a roundish teapot about the size of woman thumb nail. 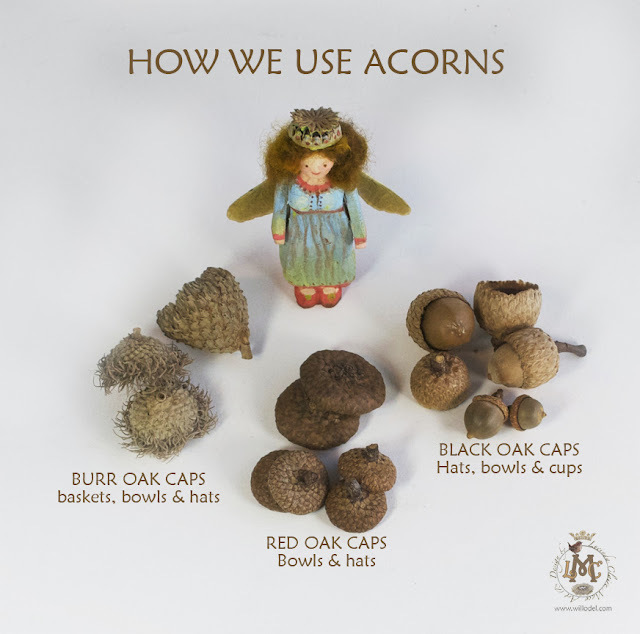 The lid is either an acorn cap or a eucalyptus cap. The spout and the handle are made from a vine stem or curly willow. Good choices are Honey-suckle, Virginia creeper or grapes . Above is both a green vine piece & a dried one. Either can work. If you find a dried curled vine, that is the right size for the handle, you can carefully insert the ends in the holes you make. The green bends better, but will shrink as it dries and look different. The awl is used to start or make the holes for the handle(two holes) and on the opposite side, the spout. Carefully start a hole where the spout would be, it looks best to angle this down a little and not have the spout point straight out. A curved vine piece for the spout adds character. 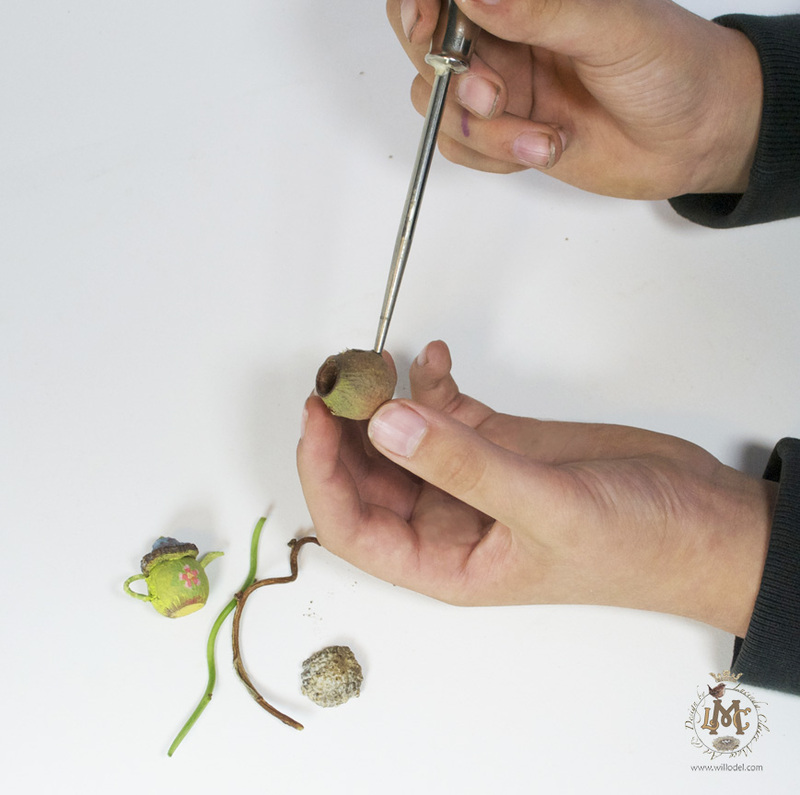 If your seeped or acorn is too hard to make a hole deep enough to hold glue and the vine tip, you can make a deeper hole with a small drill bit such as 3/32" or about the size of your vine or twig. There are three holes to make, two for the handle and one on the opposite side for the spout. 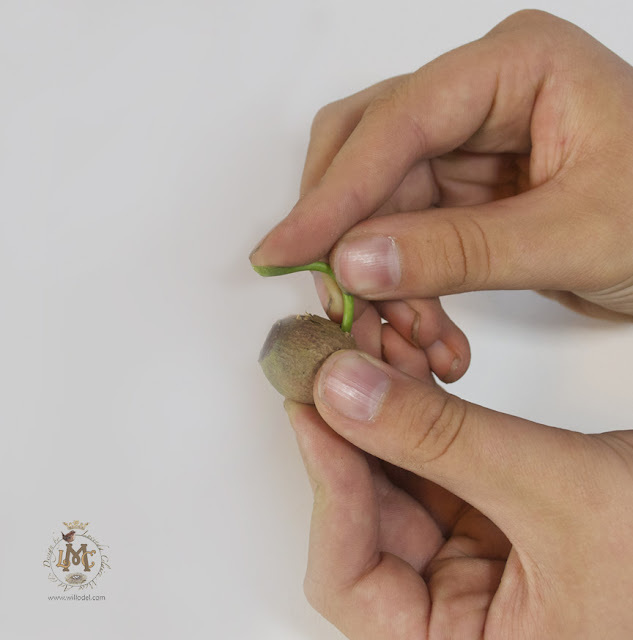 The spout hole should be higher than the middle, in the upper half of the seed pod. Here the bottom of the handle has been pushed gently into the hole, with glue and now is being put into it's top hole, also with glue in the hole already. 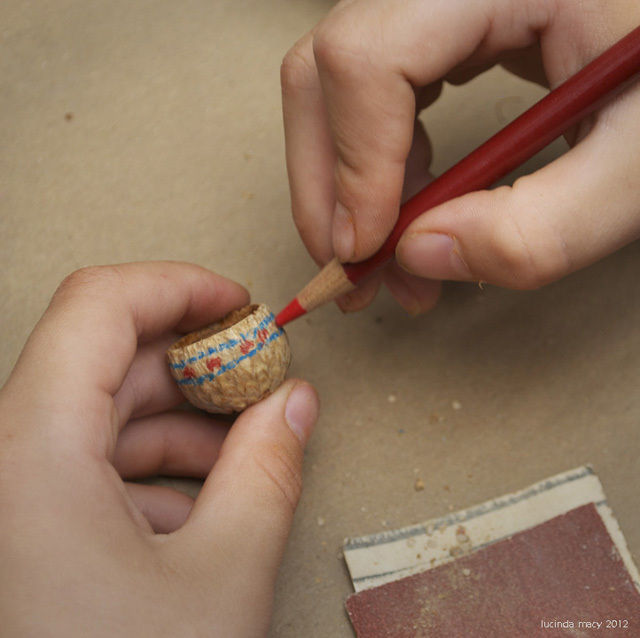 Now the spout goes in, also with glue. These green vines will shrink some as they cure, but will stay glued in the hole. 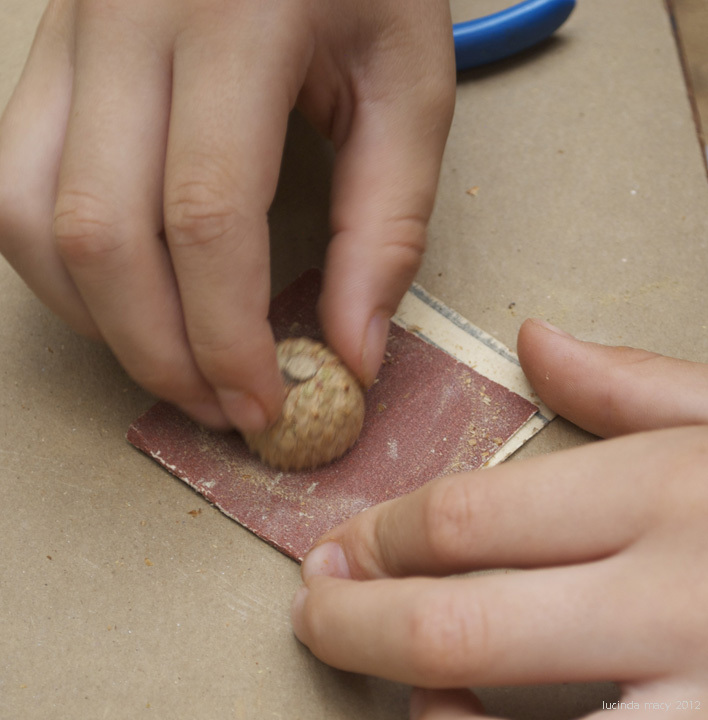 The next step is choose the lid, an acorn cap , that fits pretty well, and then glue it on. Below is the finished Teapot, which can now dry and then be painted as one likes or left natural. 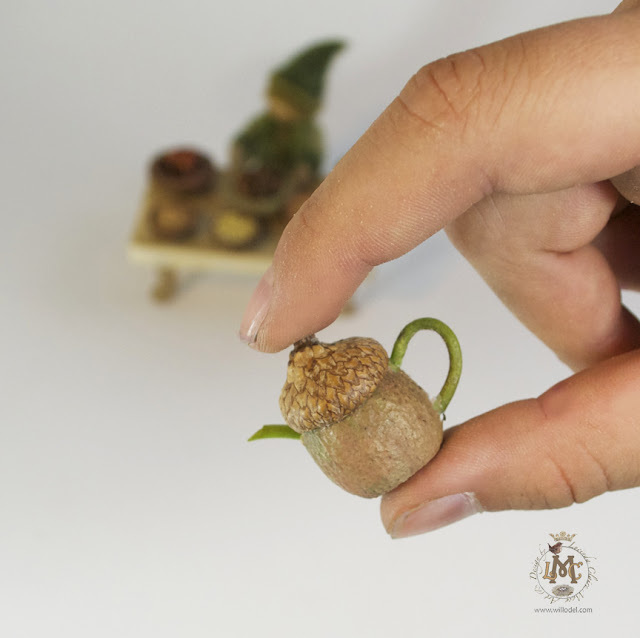 Teapots can be more challenging because they are small, because they are round and sometimes quite hard to make the holes for the spout and handle at the right angles and placement. This is where practice and patience come in! They are worth the effort for their charm and magic! 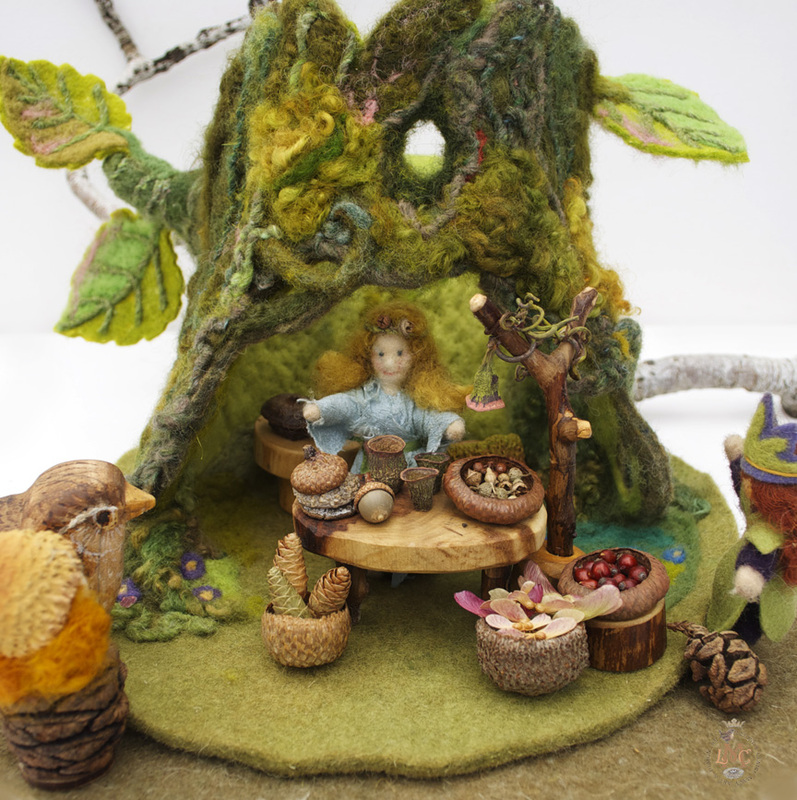 This is the Blue Fairy in Fairy shop, she is selling Maple leaf wings, Acorn cap Hats, Pine Cones for bonfires, dishes and tiny apples. Everyone is interested to buy! Holiday Celebratons are afoot & all are gathering for a festive meal together with great cheeriness and thanks for friendship. 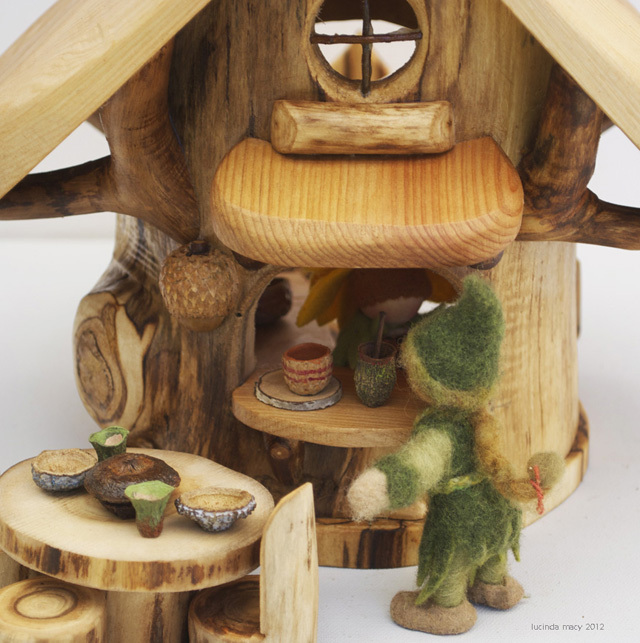 And now Leif and the Blue Fairy are having once in a Blue Moon Tea, by the Blue Fairies Wild Rose Teapot House. Hi there~ Thanks so much for stopping by! We all love seed pod dishes and so glad you are inspired by it!